Come and enjoy the Maui sun..and lifestyle. Stay in our completely furnished 1 bedroom condo that is clean, comfortable and decorated Island Style. The Maui Vista complex is surrounded by 10 acres of lush, tropical gardens. Our vacation condo is located in South Kihei, right across the street from Charlie Young/Kamaole I Beach, that is a gorgeous white sand beach. It's perfect for swimming, snorkeling, or just relaxing. 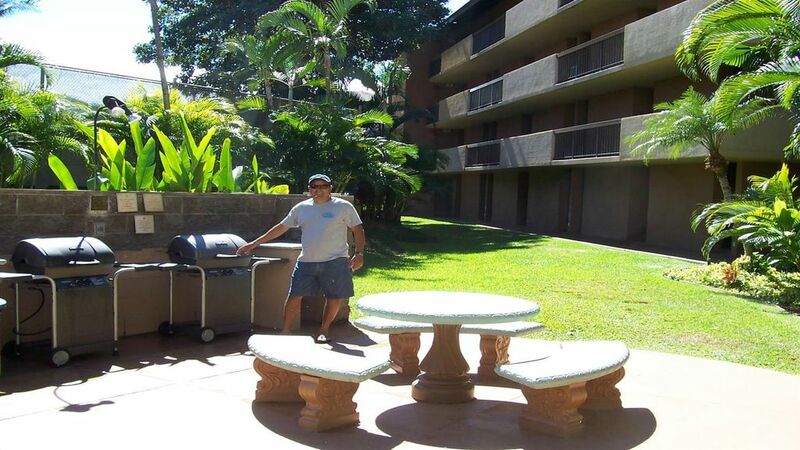 Our unit is quiet and private, one of the most desirable at Maui Vista. In's in the 2nd building, so it's away from the traffic noise of Kihei Road, yet still very close to the beach. This ground floor unit is easily accessible without having to use stairs/elevator, and since we're on the very end, it's very private. Most units here only provide A/C in the living room, but we also offer it in the bedroom, in addition to 2 ceiling fans. Our condo features a lanai, living/dining area, plus full kitchen. We have a Queen bed in bedroom, plus a very comfortable sofa bed, so we can accommodate up to 4 guests. Take a Virtual Tour right now! Just below our Calendar is a link to our tour, you can clearly view our unit, and grounds. We've been coming to Maui for more than 20 years, love it because it offers the best of all the Hawaiian Islands. Don't miss the road to Hana with the beautiful tropical rainforests and waterfalls. We recommend the snorkel trip to Molokini, or taking a whale watching boat out of Ma'alaea Harbor. Make sure to visit the shops and art galleries on Front Street in Lahaina, not to mention the Shops at Wailea for world class shopping. On a typical day in our condo, you'll wake to to the tropical birds in the garden, enjoy some delicious Hawaiian coffee and fresh local fruit on the lanai, while you plan your day. It's hard to decide...play a set of tennis, or walk across the street for an early morning swim, or maybe start out with a round of golf at Wailea...or maybe just relax by the pool. Local markets, restaurants, parks, and shops are just a short walk, and we are also just a few miles from the exclusive Wailea resorts, famous for golf, shopping and celebrity vacations! Maui has consistently been voted #1 Island in the world. Kihei is conveniently located 12 miles from the airport, on the sunniest part of the Island. We are close to all the best beaches, shopping and restaurants. Hotels in the area start at approx. $200+ a night, but you can enjoy our condo, and feel totally at home for a lot less! Ask about our returning guest discounts, and special rates for Airline Employees! I did some homework when we decided to buy, Kihei is the sunniest part of Maui, and South Kihei is the most desirable area. In order to find something affordable, we aren't directly on the beach, but a 2 minute walk from it...Right accross from Kamaole I and the famous Charley Young Beach. It's nice to have a car here, but not necessary, since there are so many shops, restaurants, 24 hour grocery within walking distance. We enjoyed our time at this property. It was conveniently located so that we could enjoy the beach and nearby shops. The property was clean and had all of the facilities needed. I would recommend staying here for a nice, quiet time in South Maui. Great location close to beach. Tricia was extremely helpful and easy to work with. Her customer service did go above and beyond expectation. Looking forward to our next trip to her condo! Looking forward to your return Monica. Aloha! We had a great time while staying in this condo. The place was clear and comfortable and everything was so close by. We have stayed in Kihei a couple times before but this place was so close to everything that we'll surely consider it again. Hopefully you can stay longer next time Terry. Mahalo! Great stay. Everything was as described. Quiet with easy access. On a scale of 10 this experience was a 3. There are numerous positives of this condo. However, the negatives just erase the positives. The sofa in this condo stunk to "high-heaven" with BO or whatever. The smell was disgusting. I am sure you will say :okay thanks for letting us know we will have it cleaned. The overall odor of this place was bad. It had the odor of mold or decaying matter that made this a bad experience. Having to schedule a cleaning crew to come in while we were staying there makes for extreme poor time management to our intinerary. Very disappointed. Receiving a negative review from this particular guest is not surprising. He booked his stay approximately 6 months ago, and after getting numerous nit-picky emails from him about his many concerns (weather, road conditions etc) as well as he not wishing to agree to rental agreement, I was very tempted to cancel his booking. VRBO frowns on that, and my husband talked me out of it. I should have followed my intuition! He complains about the smell of our 6 month old sofa. Then he goes on to say he had to pay to have it cleaned. This is really ridiculous. If he had a problem with something, upon check in, why didn't he contact us so we could take care of it. Our cleaner Kelli does a fantastic job, and I know she would have resolved any issues, if given a chance. I can only conclude this cantankerous guest will find fault anywhere he goes, even on the beautiful island of Maui. So sad! Maui Vista no ka oi! "Maui Vista is the best!" Location!!! Conveniently close to all Kihei - shopping, rentals, restaurants and most importantly the beach! Very quick walk across the street to Charley Young. Clean comfortable and stocked with beach toys & supplies! Located in the 2nd of 3 buildings, you are away from the foot and street traffic of S. Kihei (the main street through town). You must stay here to understand why this end unit is one of the more desirable ones. Very quiet and private lanai. Close to parking. Not much to complain about. My family of 4 had an awesome time & the owners are more than accommodating! Easy communication. Can't wait to come back!